Wow, exciting much!! So this is happening! The TODAY Show is coming next week!! As you can imagine, our community is eagerly awaiting their arrival… and so am I! We’re just SOO jolly super-excited to be able to give The TODAY Show team a BIG 1770 and Agnes Water heart-felt community welcome… and ALSO help them unwind and enjoy all the magic of this special place while they are here! It is going to be a GREAT Spring-time affair!! Right now there’s a big buzz in the air! There are soo many people here right now generously putting in their time to get the final touches together before the big day. To see the show, tune into Channel 9’s The TODAY Show next Tuesday the 26th of September from 5:30am through till 9am. They will be broadcasting live. So, as you can tell, I am more than a little bit chuffed and excited about all this! Bursting with excitement might be a more accurate description lol. I want to say a BIG thank you in advance to Channel 9 and The TODAY Show cast and crew (and entire team) for coming to visit us and providing our 1770 and Agnew Water community with this amazing opportunity to showcase our tourist destination, the lifestyle we offer and our home! I also want to thank everybody who has been a part of this; within our community and elsewhere! You’re all marvelous!! Bit exciting! 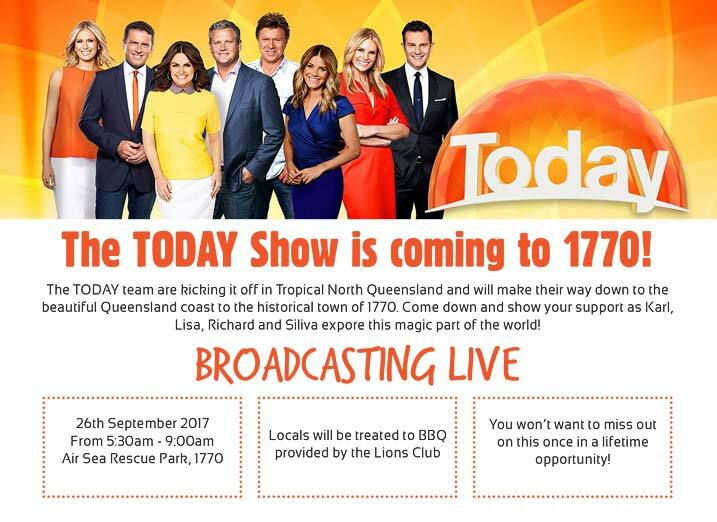 The TODAY Show will be broadcasting live from 1770 next Tuesday the 26th of September. Side note: Just want to also add that it is well worth having a read of the Media Release which you can download from here. Amongst the insightful info it also explains that when you tune into the show during next week, “there will be loads of competitions, including your chance to win tickets to see Elton John live during his upcoming Australian tour.” Woot! :). Geez I wouldn’t mind a ticket to that myself!! There will also be a world record attempt on the show: Dog trainer Chris de Aboitiz will have a crack at paddling his stand-up paddleboard with 26 dogs. Karl and Dickie from The TODAY Show will also explore the area on Harley inspired motorbikes (visit the Scooteroo Tours website to find our more about this holiday activity experience), and they’ll also try their hand at offshore fishing (check out the Fishing Offshore 1770 website, they too offer a fantastic experience). I’m sure they’ll catch some beauties! There will also be other activities.. but I don’t want to give everything away :). Hope this blog post has found you well and all is going great in your life. Take care :). Till next time. PS. I’m enjoying this blog writing thing so think I’ll write again soon. If you want to receive email updates after my next bunch of blog articles are written, simply subscribe to our mailing list in the sidebar box (it’ll be in the right-hand sidebar if you are on your laptop or desktop computer or below if you are on your phone. It’s there somewhere too if you are on your Tablet.